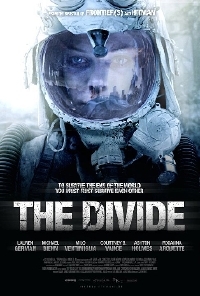 A rather bleak film for the Sunday morning slot at Frightfest, The Divide follows a group of people sheltering in a basement after a nuclear explosion. They’re a disparate bunch, thrown together by circumstance, their fragile unity falling apart as their predicament becomes increasingly fraught. It's a familiar but well handled story, underpinned by convincing dialogue and performances, essential in such a claustrophobic, stripped down set-up. It’s only a puzzling deviation in the story that lets the film down. The characters are simple and boldly drawn, not a problem in a film like this, each filling a particular role. Mickey is a cigar-chomping, Duke Nukem-style janitor played by Michael Biehn, hamming his way through opening scenes as he shows who’s in charge, leading the survivors to the basement area where he works, taking care of security and rationing food from his stores. The other characters quickly establish themselves: Eva, a perhaps overly stereotypical silent tough girl; her wet European boyfriend, Sam; Delvin, the calm, sensible one; and Josh, Bobby and Adrien, three young men who aren't very keen on Mickey's self-imposed leadership. Stuck together in a couple of small rooms and living off Mickey's dwindling supplies, it seems to just be a case of sitting it out and waiting for rescue. But the rescue isn't quite what they expected, as armed men in radiation suits invade the basement, intent on capturing the survivors to be imprisoned in ominous glass pods. The action highlight of the film comes here as the survivors fight off these mysterious soldiers, but unfortunately it's also where the narrative fails. Who are they? What do they want? These questions are never answered, as we return to the earlier claustrophobia with no explanation for this brief explosion of action. It's an unnecessary distraction from the tension of the rest of the film and indeed diminishes it, the following ratcheting up of hostility between the characters a little quiet and underwhelming after all that gunfire. It's a shame because it's otherwise effective stuff, psychopathic performances from characters descending into madness threatening and delivering some sickening violence. Why that unnecessary deviation made the final cut is anybody's guess, but The Divide is a lesser film for it. Have to disagree here - The Divide is one of the finest horror films I have seen in a long time. The last few scenes are very well done, I'll give you that. What did you make of the bit with the soldiers? I really enjoyed it - it was a total 180 point for me. It also made me realize who was behind the attacks, which not everyone got. The reason I found this such a terrifying film is because a) It could conceivably happen, and b) in terms of empathy for a character I was right there with the female lead when she realized she had to get out of that place at the end. I don't know about you but I also found Milo's performance absolute class.